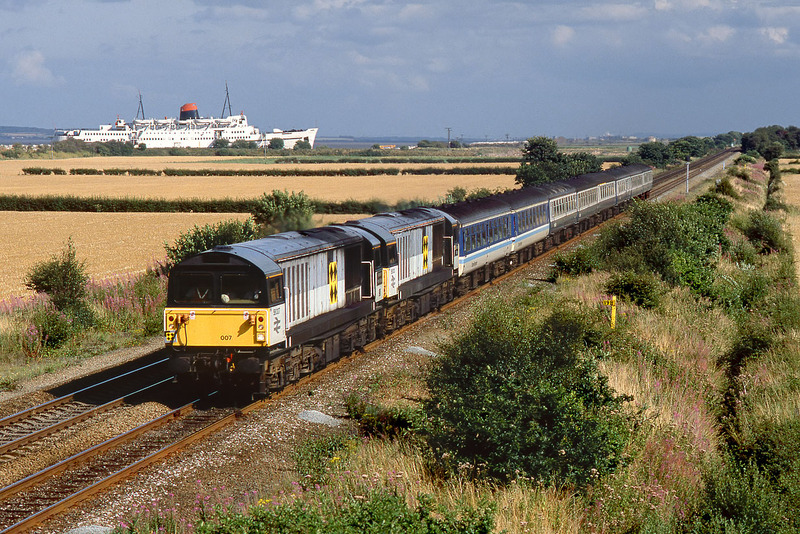 A lucky patch of sun at Mostyn on 11 August 1991, as 58007 Drakelow Power Station & 58003 Markham Colliery pass the beached 'Duke of Lancaster' ship, whilst working the 1T58 15:40 Crewe to Llandudno special, during the Trainload Coal Motive Power Day. The former Sealink 'Duke of Lancaster' was permanently moored at this site in 1979 to be converted into a 'Funship'. However, the local council reversed their initial positive attitude to the project, and have subsequently gone out of their way to scupper the project.